How to start your blog in 2019 and make money in 7 easy steps! Are you wondering how to start a blog in 2019? First off, kudos to you for taking this good decision because blogging has a lots of benefits. Before we proceed, here is the quick table of contents or steps needed to start your blog in 2019! ❝Starting a blog isn’t hard and you don’t need to know a single of HTML or coding, or any other of those pesky technical skills. Neither do you have to dent a hole in your pocket. Our this guide has helped 4200+ bloggers (& small business owners) get started with their blogs online. You can do it, too! Starting a money-making blog isn’t as daunting as it seems. I have been blogging since 2012 and am thankful to my blogs for helping me clear off my study loans, making me financially independent and ultimately living a life, the laptop style. All due to my decision of starting a blog. …I will walk you through the exact steps you need to follow to create your first blog up and running. Fun Fact: This free guide has helped nearly 4200+ people to start their own blogs. This is the guide I wish I had when I started! Ready to start your blog and make money from it? A blog or weblog is an online diary or website where you publish blog posts with your audience with the aim of sharing some information, solving a problem or interacting with them via comments/shares and views on your entries. Most blogs these days play an active role in informing the readers, shaping their opinions and earn a handsome revenue in the process. Before diving into the step by step guide to start a blog and make money from it, let’s have a look at why to make a blog in the first place. Express yourself; showcase your talent: Through blogging, you can get a way to express yourself, share the talent you have in you.This can be anything like health tips, productivity lessons, kitchen or gardening, business strategies and everything in between. You can help others: With your talent, you can help others succeed in their business, get more sales and even lead a better life. This is incredible because you reach to an audience worldwide and help them. Earn money from home (or anywhere): The best benefit of starting your own blog is making money from it. Blogging gives you financial freedom.You don’t need to have a brick and mortar shop neither you need a 9-5 job, with blogging you can make money right from your bedroom/basement.I recently gifted my father 1 million INR ($15,000 approx.) to renovate his (offline) grocery shop. And let me tell you, his smile and pride in his eyes was something I will rejoice my whole life. Get fans and followers: Blogging, if done right, can earn you name and fame in addition to money. You can create a personal brand and grow your fan following. You might want to read this post on benefits of blogging to see 21+ lucrative advantages of blogs that non-bloggers are missing out on in life. After that’s done, let me show you the process of building a blog online and earning money from it. A blog niche is a category or topic that you will write about in your blog. 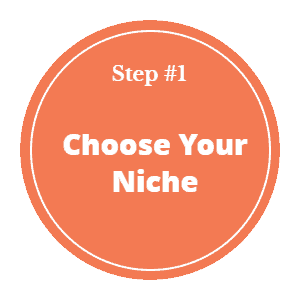 Choosing a niche is important because your whole content strategy will revolve around your chosen niche (topic) and will attract the right audience to your blog. Choosing a blog niche depends on what your end goal is. If you are a wedding photographer you need to write about topics that potential couples search often on Google (like best destination wedding tips, bridal/groom makeup etc). This will give you visibility in front of your potential clients and thus you can get hired. Blogging is all about passion. If writing about something can keep you up even at 4 in the morning, I think that’s a good topic to start. On the other hand, if you are writing about a topic that doesn’t interest you, you will not be able to pull it off. You don’t need to be an “expert” to get started with blogging, start a blog on something you are well versed with can give you instant recognition. Are you famous in your family for making delicious cookies? Are you interested in movies and latest music releases or gossips? These all can be good starting point to think about a topic that you actually know very well. If you don’t find anything, simply create a blog and start writing whatever you like. One or 2 months down the road, you will find your flow and start getting audience/readers that connect with what you share. That is what I did when I started. I wrote about random things like tech, news, tips about food and everything in between. After some time, I found my audience responds when I share blogging tips and that’s how it all began. 3) What type of audience do you want in? If you want to start a blog and make money from it in 2019, you have to attract the right audience/customers to your blog. Not all will be interested in what you say or sell. To get the right people read your blog you have to write posts they are looking for. Are your ideal audience (buyers/readers) having a problem? What do they search on Google? What type of lingo they talk and what products they use in their business. These are basic things you have to think before starting a blog. For example, if you have a dog grooming product to sell, you could start a blog online and write about how to groom your dog, how often to cut nails of your dog etc. This is when your blog will come up on Google when someone searches for the above questions and you will get exposure plus sales. A domain name refers to the location of a website on the internet. It is found in the address bar of the browser and helps you access the desired website/blog on the internet. In simple language, a domain name can be explained as the address of a house you want to visit. If I tell you to find my house then how will you react? You probably will ask me my address and then you will reach me, right? Similarly, every website or blog has its own unique address on the World Wide Web. The address of the blog is in a format called URL (Uniform Resource Locator). In whole, it looks like https://www.example.com in which example is your domain name which is subject to availability that means you can register only for those domain names which are available and not registered by anyone before. 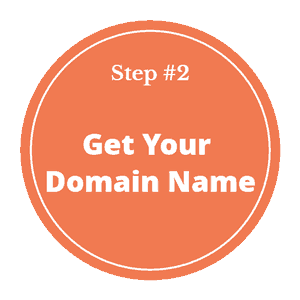 Looking for domain selection best practices? Make sure your domain name is short and memorable. Choose a domain name that reflects your brand or business. Choose a domain name that gives you full scope to expand your content scope. Like if you choose a domain name like getflatabs.com you will be restricted to content revolving abs fitness. After a while, you’ll run out of blog ideas and monetization opportunities. Even if you try and write about toned thighs on the blog it will be a mismatch. Always go for a .com version unless it is previously taken. Avoid choosing fancy domain names since they are hard to remember. Avoid numbers, hyphens, and symbols in your domain name. They cause a lot of confusion and make it impossible for your readers to communicate your URL with others (like via phone). Wondering, I have bought a domain name… now what? Well, now, let’s now look at the best sites for blogging. A blogging platform (often referred to as a content management system) is a platform that delivers your raw data into a human readable form (blog) where users can read your posts, shop products and interact with you. Don’t fall prey to lucrative tutorials that read how to create a blog for free. Most of them have huge limitations like you cannot monetize them. These blogging platforms are a mere collection of text (like a journal) that isn’t a full-fledged website. Free blogs do not have any SEO value, meaning you cannot rank a site on Google or get visitors to them no matter what On-Page SEO techniques you follow. The main demerit of making a free blog using free blogging platforms is that you don’t own your content. They can delete your site permanently without having to inform you. There are many blogging platforms out there but the most commonly used is WordPress. WordPress is the most used CMS in the world because it is robust, easy website builder (requires no coding knowledge) and feature-rich (you can create a website on almost any topic with WordPress). That’s where you should start your blog in 2019. This diagram shows why WordPress is one of the best blog sites to use. 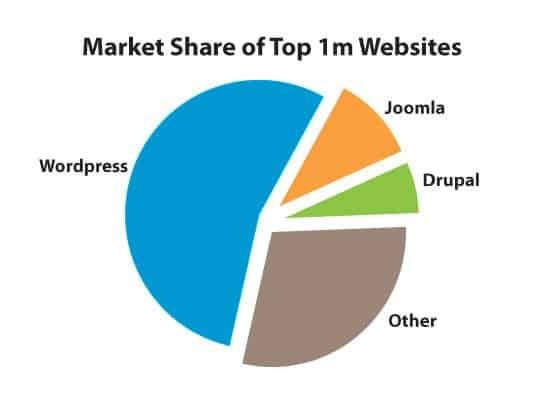 WordPress.org market share when we compared the top 1 million blog sites or blogging platforms. WordPress also is divided into 2 versions, the free WordPress.com and self-hosted WordPress.org. To make it easy for you, WordPress.com is free and limited version of WordPress. You cannot add themes/have the other WordPress futures and you cannot monetize it either. WordPress.com helps you to start a blog for free but it is hobby focused and cannot be monetized or used as a business blog. This tutorial is focused on creating a self-hosted WordPress blog. This is what I use and any other blogs you know use. Let’s head over to choosing the web hosting for your blog now. …you’ll need a web hosting account to host your website. What Is A Web Hosting & Why Do You Need It? A web hosting is the storage space where you will host (or store) your website database (like text articles, images, and other media files) for others to access. Think of web hosting like a brick and mortar house where you will store/showcase your products for others to view and purchase. You need a web hosting for your domain because anything you want to do with it like create a portfolio website or start a beauty blog, you are going to need to store that data somewhere, right? For example, this very article you are reading has all its images and text stored in the Bluehost’s (my hosting provider) servers from where it is delivered to your computer. has a good customer service. Did You Know? Bluehost is officially recommended by WordPress.org as the preferred web hosting for site owners to use. One more thing that you’d want to know is, Bluehost provides FREE SSL for your blog. SSL certificates are a Google ranking factor and they induce more trust amongst your visitors for your blog. See the “secure” symbol prior to my URL on your address bar. This sign of credibility helps best when you want to start a blog and make money from it, in a professional way. FREE OFFER: If you haven’t already bought a domain for your blog, don’t buy. You will get a FREE domain for lifetime with Bluehost! To get started, click here to open Bluehost as a new window tab. Don’t worry the current tab will stay open for you to refer the steps. 1) Once the page loads, click on the big green “get started now” button to get started with hosting for your blog. 2) Select your pricing package. Be sure to choose the basic plan (1st column) in the image below to avail the cheapest hosting offer. This plan is enough for you to get started without any issues. 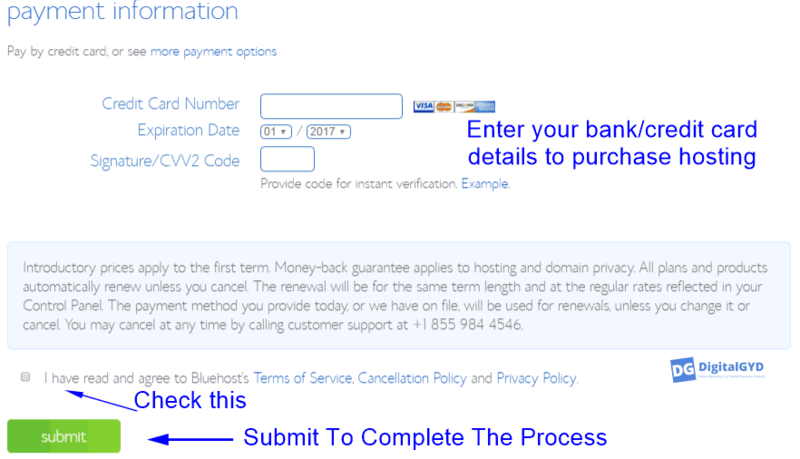 Bluehost enables you to lock your hosting for 3 years at a very cheap price ($3.95). P.S. 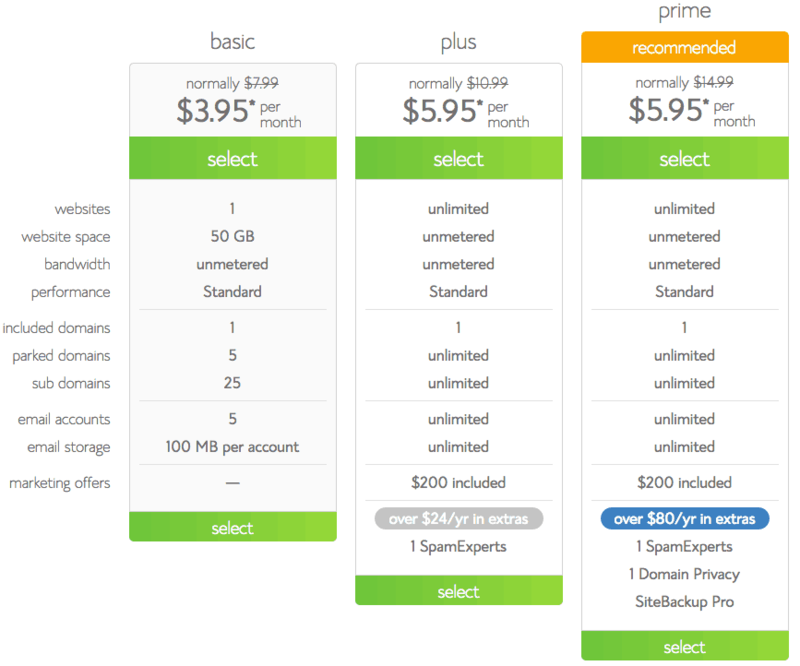 You can also choose the hosting for 1 year but then you have to pay $7.99/month. So, it is a better choice to get hosting for 3 years instead with a little more spending. Remember, Bluehost is the cheapest hosting you can get (which meets the customer satisfaction). And, you can recover your investment because your blog will be making money by the end of the first year itself (I was making $350 per month by the end of my first blogiversary!). So go ahead and choose the first basic option. 4) After that, you will be asked to fill your account details. Don’t panic this is just for billing process and involves full privacy protection. On the same screen re-check your package information. Make sure to un-check the things I have marked they are not necessary and simply add to your price. Further below on the same page, enter the bank details and hit the green ‘Submit’ button to complete the process. Congratulations! You have successfully purchased a hosting account for you. 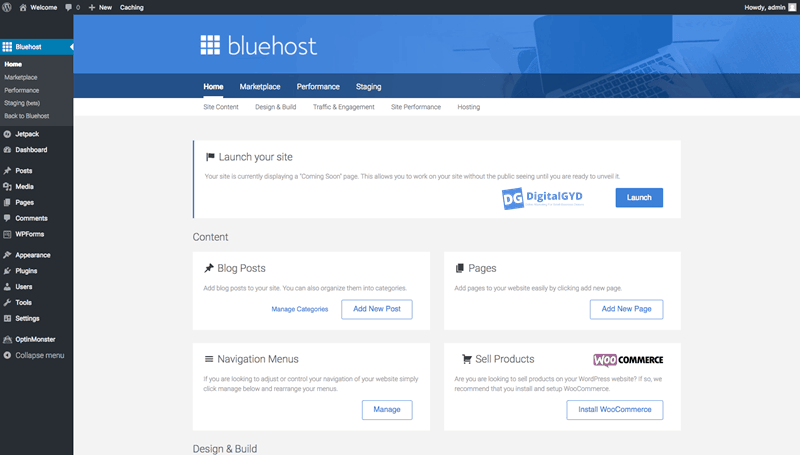 PLEASE NOTE:This tutorial to start a blog using Bluehost Hosting is the updated and latest version. Unlike older and un-updated tutorials on the web, you no longer have to go to the cPanel to create your WordPress installation. Now, you just have to choose your preferred password and after that you’ll need to choose a theme. The website is automatically added. Don’t worry you can also change the theme afterwards. It is recommended as the free themes are often devoid of functionalities. Congratulations! Your WordPress blog is ready and running. Once you have installed WordPress on your Bluehost hosting we have literally completed creating a blog for you. Now that you have started a blog, are you wondering how do I set up my blog? The new Bluehost interface guides you all through your WordPress dashboard including suggestions to write posts, publish an about page etc. Still, if you want to do things manually, which is what I prefer too, don’t worry! In this section, I’ll show you initially setup of your blog including important setting configurations, theme changes and getting it up and running for the public launch of your dream blog site. To be able to change or edit anything on your blog you have to access its dashboard. How To Access Your WordPress Backend (Dashboard) For The First Time? To access your WordPress dashboard you have to head over to https://www.yourchosendomain.com/wp-admin. 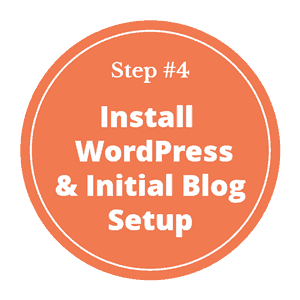 Step 4.1) How To Install A WordPress Theme And Set It Up? A WordPress theme is what decides how your blog looks and feels on the outside. Themes are what makes every website you visit look different from one another. The default theme of WordPress is pretty basic and useless when it comes to setting up a money-making blog. It has limited or no features that themes should have. You can feel it when you see your newly-setup blog and compare it to mine (the page you are reading now). To change your WordPress blog’s theme, head over to dashboard >> Appearance (on the left-hand option panel) >> themes. Click on the Add theme button on the upper left corner of the new screen (screenshot below). Now you have to upload a theme (zip file) that you’ve previously purchased. Never go for a free WordPress theme or a premium one that is available for free or has been shared with you via a friend. Free themes are the #1 cause for site hacks & you wouldn’t want your site to get hacked. I have been there, I have done that and trust me it makes you feel broke because it is ultimately your decision that caused your site to get hacked. You get premium support from the theme developers when you get struck with something. Premium themes give a branding to your site and signal your readers that you are serious and are here to be in business. Here is a list of 51+ themes for bloggers for your new blog! Since I am here to tell you the correct way to start a WordPress blog, I want you to save money on your journey too. There are a plethora of brandable themes and AdSense Optimized high CTR WP themes. But, if you want value for money you should definitely opt for Elegant Themes (read my complete Elegant Themes Review 2019) which are beautiful, feature-rich and affordable and trusted by 401,000+ users. You get 87 different themes for only $89 which is a great deal. Click the button below to get your copy of Elegant themes and proceed further. Feel free to use our exclusive Elegant Themes discount coupons to save even more! Step 4.2) How To Set Up Your Permalink Structure? Setting up the permalink structure for your new blog is important because it defines the URL structure after “/” of your blog address and it heavily helpful in SEO (as well as user-experience) if it is optimized well. To change your blog’s permalink structure, go to your blog’s dashboard >> Settings >> permalink settings. This is the simple, neat and the most SEO friendly URL structure. Additionally, having an uncluttered URL format can help in user experience and be in the mind of your readers. Often, WordPress blogs come with default posts like “hello World” and plugins like “Hello Dolly“. These are usually crap and add no value to your blog. Make sure you remove them by going to post section and deleting the post and plugin section to delete the plugin. WordPress has 1000s of plugins that help you in different purpose. You can install any plugin but you shouldn’t do. using more plugins will eat up your server resources leading to slow site and downtime. Here is a list of best WordPress SEO plugins that you can refer and use. Using Yoast SEO (free), the first plugin on that list is essential. So, click here to know the step by step process to configure your Yoast SEO. Akismet is a free WordPress security plugin that keeps your blog safe from spammers & fake commenters. 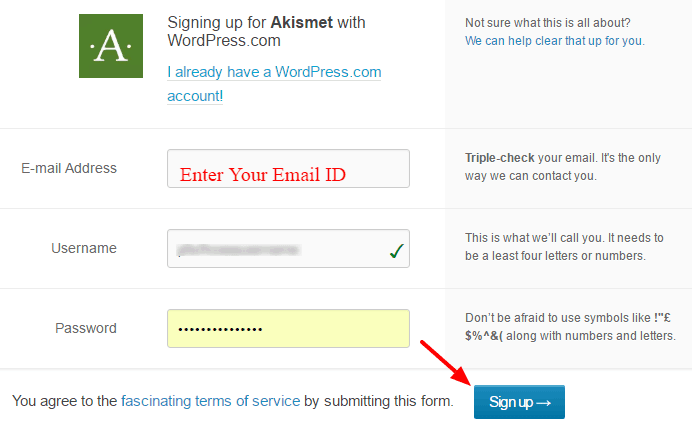 Akismet comes added to WordPress by default. In case it isn’t there in the plugins section (dashboard>>plugins>>installed plugins) you can add it by clicking the Add New option in the same section. Then search for Akismet >> Click on Install >> Activate. 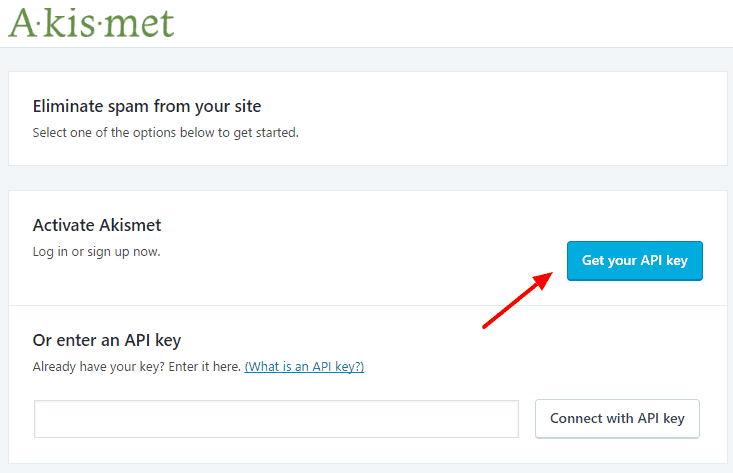 To get your Akismet API key, simply click on the Get API key button on the next window. This takes you to the Akismet for WordPress page where you again have to click on the big Get An Akismet API key button. In the resultant page, you need to signup for a free WordPress account. After you click signup, you are taken to the pricing page. Make sure to sign up or choose the first (free basic) option. Now, get the API key and insert in on the Akismet plugin page on your dashboard. You should always make sure to install a backup plugin for your WordPress blog. This protects your data and stores the whole site as a backup. In case your site gets hacked or gets deleted by you accidentally or is attacked by spammers, you can use this handy backup to get started with blogging again for free. I use the BackWPUp plugin which is free and has options to upload automatic backup schedules to your Dropbox or desktop hard drive. The aim of blogging is to get more and more people to read it so you can help them and get revenue. The more the traffic to your site the more the money flowing in. Installing social sharing plugins helps people to share your blog posts to their social profiles and email or bookmark them for future use. A good number of social shares increases the credibility of your posts and hence boost authority and trust. Check the left-side of this article, nearly 4200 people have shared it across social channels thus bringing in, even more, people to the article. They also show that 4000+ readers have actually liked this step by step tutorial on how to start a blog and make money from it and thought that their friends and followers will like it too. I use social warfare here on my blog ($29/year). Social Warfare is lightweight, clean coded and have several features that help in getting more shares (like mobile optimized, pre-set tweet that can be tweeted in 1-click, different tall Pinterest image etc). If you’re not in a state to invest in a feature-rich premium plugin, you can use the free basic sumome share plugin. An about page is the most visited page of a blog since every new visitor that lands on your blog will be curious to know about you and your blogging journey (visions) etc. To write your about page, head to dashboard>>pages>>add new. Make it about your visitors rather than you. Write in a personal yet clear tone. Don’t use the third person. 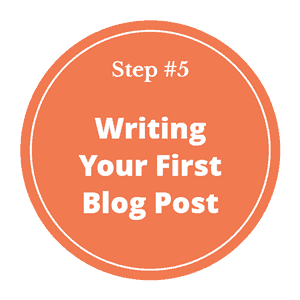 After that, publish your very first page on the blog. How to add a contact page? Follow the above guide to create a new page on WordPress. 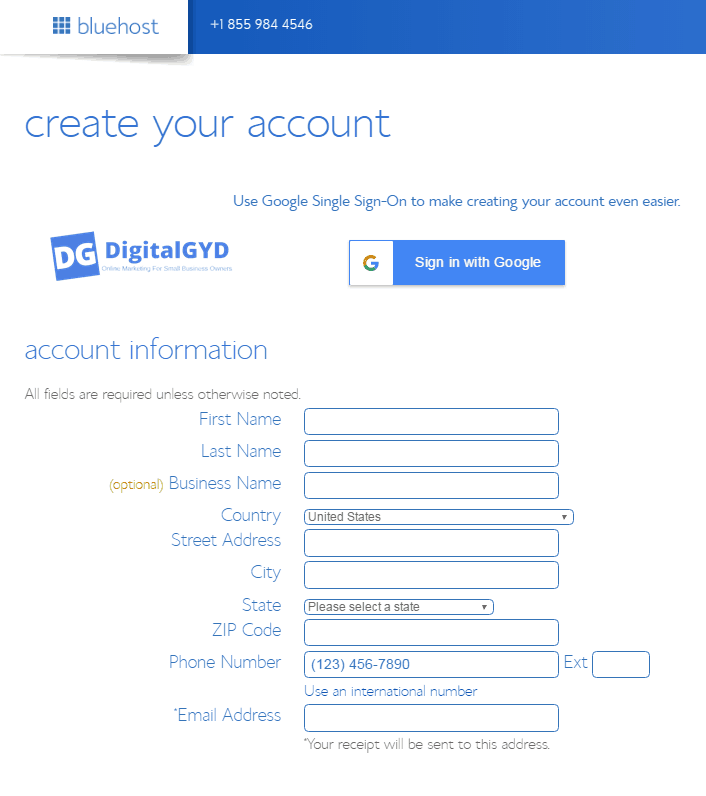 Add the WPForms contact form shortcode you get to the new page and hit publish. Similarly, to create a disclaimer page for your blog simply head over to free online disclaimer generator tool and fill up the info and follow the above process. They are the least viewed pages on your blog, however, you have to have them to avoid legal procedures and stay safe from potential breaches. Similarly, other added benefits of having privacy page & disclaimer page on your website are they show you are a serious business and help you in easy approval for ad networks like AdSense. So that’s it! You have successfully created a money-making blog for you. Wondering how to start a blog post? To write your first blog post on WordPress, go to the WordPress blog dashboard >> Posts >> Add New. Writing a post is as easy as writing a page in WordPress. Pick a topic and research on it (using Google scholar, Wikipedia, and other blogs that rank for the query. See what they are writing, how they represent and what they are missing. Check the comment section to see the readers’ reactions and questions on the topic). Add content (paragraphs, sub-heads), images and videos (essential to get more SEO backlinks). Make sure you follow all On-Page SEO techniques. Check everything in the preview mode. Things to do before publishing a blog post. Now that you have finished setting up your new blog, published essential pages, and a couple of posts, your new aim should be to get traffic to your blog. Everyone likes to start a blog and make it popular but a blog isn’t popular by itself from scratch. That is why you need people or readers or traffic to truly start your blog making money. 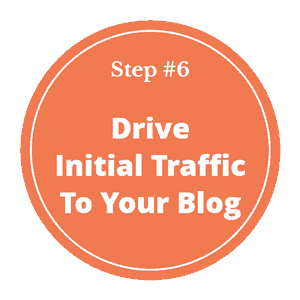 Here is how you can drive traffic and make your blog popular in no time. Getting traffic from search engines will take a couple of days but prior to that, you can drive insane about of traffic by other means. This referral traffic will help you get a boost, some user interactions, and aid in getting your new blog indexed in Google (or other search engines like Bing) faster. Make sure you have at least 5 articles before publicly launching your blog. This will give your readers enough data to check out and gauge your blog and make them wait for more. Email your family and friends about your new blog. Give them the homepage link and ask them to leave their opinion as comments on the blog posts. Tweet out your posts with relevant hashtags. Go and leave comments on other relevant blogs (Feel free to comment here in this article and I will tweet and share your blog with my 30,000+ followers!). Find out blog communities and forums (like HellBoundBloggers Forum where you can answer questions in your niche and include a link back to your blog in the signature. Join communities like viralcontentbee.com where you earn points by sharing others’ posts and invest those points to get shares for your posts. Real people Real share. Join Facebook groups that allow self promotion and comment on weekly threads about your latest blog posts. Try to interact and form a friendship so that you can mutually promote your blogs and benefit. Make your first posts speak for you. Write quality articles on everything you know about the topic you are writing. Link to authority bloggers in your articles and tweet them to let them know that you mentioned them in your article. Ask them (politely) to share your article and most will do it. Needless to say shares from influencers can bring you a hell lot of traffic. 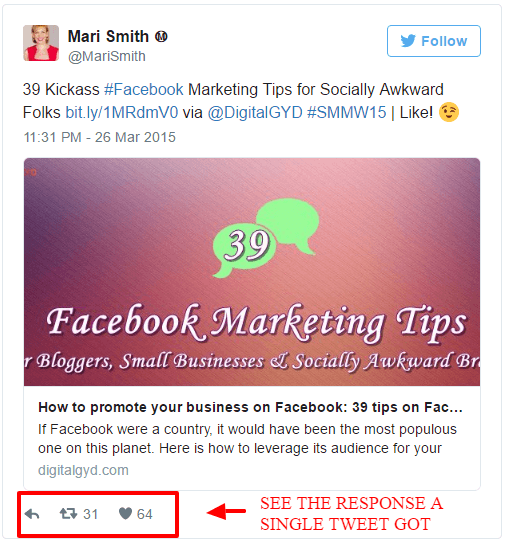 This single tweet from Mari Smith gave me more than 500 visitors (combining her traffic from her followers tweets and LinkedIn shares too)! How to brand your blog on Twitter & get traffic from it. This article on how to start a blog and make money 2019 will be incomplete unless we don’t talk about making it profitable. No one wants to make a blog for FREE unless you are an NGO or a want to run a hobby blog. Even if creating a money-making blog might not be your motivation, you cannot create a blog for free. The reason being, a blog runs on resources like hosting, themes and other expenses. 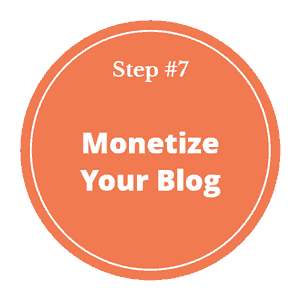 So, in order to make your blog profitable you need to monetize it or have to spend money from your pocket which is not our aim here. In this section, I’ll explain how to make money with a blog for beginners. There are many ways to make money from your new blog. I have listed some of the most potential and profitable ways to monetize a blog as soon as you start it. The second option on the list below is what you can use to make money as soon as you start a blog and make money without even having much traffic. Selling Ads: You can make money by placing ads like AdSense or media.net (if you sign up through that link of media.net, you’ll get an extra 10% above your normal income for your 1st 3 months!) on your blog.Make sure your blog has some growth before applying for them. Offering services: This is the fastest and most effective way of monetizing a new blog.You can provide services in anything you do well like managing social media accounts of clients, bookkeeping, becoming a virtual assistant (VA) or providing a freelance writing service.I did earn my initial income by providing freelance writing services.You can also pitch potential clients and show them your website as your portfolio for writing samples. Creating a product or course: I am not sure if this applies to you but if you already have a soft design of a product or a course on a topic you are expert in, you can create a blog; form a community of potential buyers around it and then sell it to them. Infolinks: Infolinks is an in-text ad program that can be used to earn money from ads in your blog’s text.Read my Infolinks review and learn how it can be used to earn money as soon as you start blogging online and don’t ignore media.net because it works like a charm. Affiliate marketing: This is a great way to make huge money from blogs but you need to have patience and know your audience.After that, you can pitch or show ads to them based on what things they are interested in.Shareasale is a good place to find best high-paying affiliate programs for bloggers and enroll in them.Again make sure your blog has some traction to avoid application cancellation. Wrapping Up Our How To Start A Blog In 2019 Guide! Congratulations! You Have Successfully Created A Blog For You in 2019. What’s Next? What To Do After StartingYour Blog? ➜ Sign up for my newsletter here to stay updated with latest blogging tips and resources to successfully grow your new blog into a money-making machine! Anything you want help with for getting started with your blog? Since this article is a free step-by-step guide on how to start a blog in 2019 and earn money from it, I have covered all important things that you should know when creating your own new blog. ➜ In case you have any doubt or need help with creating a blog or anything you want to discuss regarding the best way to create a blog and make money from it, feel free to reach out to me via the comments section. ➜ If you liked this post on how to start a blog in 2019, feel free to share it (using the social share buttons on the left side) with those you think might benefit from it. Every single share counts! I appreciate your effort. I want to let you know that like every other business in the world, blogging isn’t obstacle free. But, I know you can do it. Regular, consistent posting, some social networking, and patience are all you need to start earning from your blog. The journey between starting a blog and making money from it is always very enjoyable. Embark on it now! Give it a shot. Start your own blog and make money from it now. Nice post, I also want to start a blog for 2 month and This is very good blog for me and every one who want to be a blogger. Nice write up,its a great help to me as a new blogger to start my blog effectively. Most especially the monetization of blog section.l will follow your point.Thanks for the write-up. Great post on how to start a blog! Thanks for sharing this amazing post. The section where you guided about WordPress installation was stellar. I would love to know if it works the same if you are migrating your blog from blogger to WordPress. Awesome and one of the finest guide on starting a blog. You’ve almost covered each and every topic Swadhin. Choosing a niche and keyword research are the two most important part and if you can crack these, you’d surely earn a decent income from blogging. That was seriously epic! I haven’t read such an awesome post in a long time. I, personally, feel that there are only 2 things that you need to take care of before you start a blog. One is picking a good niche, one that you can write several articles for, and second is picking a good hosting, as that’s the backbone of your website and could either take your blog to new heights or completely ruin all your hardwork. I don’t really feel that a domain name is that important, because if your content is good, well-researched and well-written, you will be able to build a brand around whatever you chose as a domain name. When Harsh Agarwal started “ShoutMeLoud”, who would’ve thought that it would become one of the biggest “blogging” niche blogs in India. I’m also a blogger but didn’t apply any strategy and I’m glad to see your post now I’ll follow you, You’re my mentor. Great guide for people who want to start a blog. You have covered almost every section beautifully. Thanks for such comprehensive guide. Awesome guide Swadhin! Loved it. Its always good for newbies who are keep on searching for this kind of guides or help. This will surely help them get started without any help of other people. The post explains everything. Wow! This is a very comprehensive post. I launched my blog 6 weeks ago and I picked up lots of great tips. Thanks! I have to call it a guide and not a post, as you’ve covered everything a new blogger would want to know. As I was reading through, I was just wishing that we had such guides way back when we started blogging! Things would have been so much easier for us, isn’t it? As you know, I started on a free Blogger platform, way back – and then switched to WordPress and followed the steps mentioned above. However, it was all a self-learning process, as perhaps must have been for you and most other bloggers, as we are new to the blogging world and only learn with time. But so glad we made it here – eventually, and are now in a position to share the knowledge we gained over the years, with others! These are wonderful tips to help people starting out with their blog! I wish I had seen your post a year ago!! These are great tips! I switched from blogger to wordpress two years ago and I am SO glad I did. It is so much easier! Great tips! Your blog post offered real step-by-steps instead of just filler fluff. Well done! This is a great article. I am going to check out the back up plugin, since I don’t think I have one installed, and have been wanting to to do that. Problem solving blogs are always appreciate by readers and those are evergreen. Someone picks a niche they love to write about and don’t realize that there’s no money to be made. This is the most important question to ask yourself and if you’re not passionate about the niche that you’re blogging in then that’s a very bad sign. I truly believe that passion is a key factor for success. Domain name should be related to keywords that people search for on Google. We should always try to choose domain like which is not a subject of complex, it should be simple so that people can easily access. Eventually, thanks for revealing a light on this topic. This is a great informative post for new bloggers, when I started my blogging career I don’t all the requirement which are essential to blogging, slowly I came to know about the different elements which are important for blogging, this guide will help new aspirant bloggers to know all the information at one place. I just landed on this article from your sidebar widget, anyway thanks for the great post, see you soon with another article. I would say that it is an excellent write-up Swadhin. I can see your blogging passion in the post. All the points are precise and neatly explained. I would like to link this post on any of the suitable blog posts of MMF so as to help the newbies to get A-Z blogging stuff at one place. It is a great post indeed! This guide will definitely help all the new bloggers, as well as other bloggers. To create a blog is not that tough but then managing it is a task in itself. Also joining new blogging communities plays a great role in building a relationship with bloggers. You are right about all the things mentioned from choosing the right domain name, to the hosting services and more. Blogging grows over time and this will definitely help me in the long run. You have provided an easy and simple way to have a money making blog. In my view, every newbie should read this awesome post. It’s been long for me nearly a month to be on DigitalGYD as a reader but today I made my time out reading this wonderful post. No doubt this is the best for the one who is looking to start a new blog and doesn’t know much about the term blog and what blogging is. How it could benefit or help in making money or represent brands. Well these days even big brands like askme or tata are looking for bloggers and giving paid post opportunity by using third party sites like blogmint so there seems to be a coming boom and ease to earn for bloggers. I am new here ,Naveen bro share this post with me after read this post i think this post include everything in it that a blogger need for make his blog a valuable place to all and also earn money from his blog.What a great explanation by you.Thanks for this.I will use this strategy for my blog.And keep your support like this for new bloggers. What can I call this post? Epic, Brilliant, Wonderful piece of art, A must read guide. This is a detailed step by step tutorial on setting up a blog. The beautiful thing about this post that it is concise and so easy to digeat . I love the tips and the strategies for marketing on Social media. This is a must read for every newbie. I will pass this to others. Thanks for sharing this aweaome post. Well, blogging is the most important tool for doing online business. Many people build a realistic dream, and enjoy travel a lot around the world. You know..? When I started my first blog, I knew nothing about online business, and blogging. I know that I could make money with blogging. I just to learn some small earning from writing those online content. I created my first blog, I got a lot of problem because I did the mistakes of choosing hosting service for my own blog. Another mistake is that I did a lot of mistake with SEO my blog, I got banned. Thanks for sharing..! This really awesome and detail step by step guides that make newbie blogger sense about how to create the blog and make really money. This is my second visit to your blog! This is so impressive and you really are a shining star. I have recently started following your blog and I am damm sure I can benefit much from your life experiences that you post on your blogs whether it be related to social media, SEO or blogging. This is another epic post I found here just after series of a few posts of the same type. It shows your productivity level is at its peak and surely you will be making a wise decision of what to create and share as well as what to create and hold for sharing for an appropriate time. Creating and sharing are very strategic decisions in blogging. In this post you have covered all the topics that one needs to understand for starting a blog and then taking it to a strong foundation for later on taking up and up to reach the height of excellence. Your experience in this field is the main support to make you create this very practical post and nowhere in it I could have found any theoretical approach that shows how solution-focused it is. One thing I would appreciate in particular and that is the table of contents in the beginning that made the whole post more valuable to let readers go through the points which they need more badly to improve their blogging skills. Thanks a lot for sharing such valuable and comprehensive post. I agree with choosing a domain that is easy to remember. Indeed, if I were a user I would easily remember the domain of short and clear. Thanks for sharing this lengthy great article, Swadhin. I really appreciate your hard work. I will share it right now! Standing ovations for you to do so hard work and making this guide help a newbie, as well as other bloggers too. To create a blog is not a tough task but managing it needs hard work. In this guide, you have mentioned a lot of great tips that will help blogger to manage their blog successfully. If any will follow these all tricks and tips, I am sure he will get success in his blogging career and will touch new heights. Blogging communities plays a great role in building a good relationship and increasing engagement on any blog so I will also recommend to all that they should join blogging communities and participate there on the regular basis. This is an excellent posts to help out bloggers of all kinds! I for one am brand new to the whole industry and the complexities of everything have really blown me away. I have bookmarked your site because it is SO in depth and very helpful to people like me. I am impressed with your attention to detail and ability to clearly explain everything. This article will be so influential to me and I am grateful you wrote it! Keep moving and rocking, Swadhin! After a long time I have landed here and I am very happy to see this content. Congratulations for the 4400+ words. Well, I must say that this is an ultimate guideyou have ddescribed all the necessary things to do before and after setting up of a blog. This is really awesome. Isn’t it sir. We will love to read such kind of information from you. Well, thanks for this content. And I can assure you that many of the newbie bloggers will get a very detailed guide. i selected a domain xplodetech for my blog. Actually, i selected this domain without knowing the fact there are other similar domains such as xploretech and xplore-tech. I have been using xplodetech for more than 6 months. So far no problems. I got google adsense approval with this domain. Will the other two domains cause problem to me? Great effort, this article driving best information about how any beginner can set his own blog step by step.. this is very helpful, truly if any one read this awesome guide then he can easily done blog setup task.. awesome work.. But inside this article some thing is messing like, all step by step demo how we can done all these given task in real like.. how to set step by step domain into cpanel, how to install step by step wordpress into cPanel and etc. Hello Swadhin , First Thanks for your complete guideline. To be honest, i have never find any Blog with Complete guideline within only One Post. Just Amazing Good Job Bro. By reading your whole article just realized that i was doing some thing wrongs. But, from today, i am going to follow your these steps one by one for my Blog. Perfect guide for anyone who is looking to start a blog. Loved this well explained guide. Thanks for writing such a useful article. Thank you for those words. This was one of my dream posts that I wanted to publish here. I am glad you liked it. About hosting, yes we need to be careful. Yes we bloggers have to learn a LOT from our mistakes. Swadhin, this is definitely one of the complete guides which may be helpful for many new bloggers. It may help them in knowing that how they can start a new blog and what things they need to do to for establishing a blog properly. According to me, it is very important to choose a perfect domain name. We can change the hosting later on, but changing the domain name may not be possible. Readers may not be able to remember the difficult names easily and at the same time branding blogs with not easy to remember domain names can be a very difficult thing. A good domain name, quality content and right social marketing strategies have helped many bloggers in establishing an unique identity in the blogging world. Earning money from blogging is something which requires good knowledge as well as patience. I hope that this guide will motivate freelancers too to start their own blog so that they will be able to earn passive income too. I am sure people are going to love all that you shared in this one post, making it a real resource for all those who wish to start a blog and want to know more about it, because I know many new bloggers seek answers to the questions you gave us here. It certainly reminds me of my initial days of blogging, and how I was all new and never knew the ABC of blogging! I wish I had such a guide way back then! Yes, I do use a hypen between my blog name…lol…never knew about it then, and the name was already taken, but I guess it works now. You are right about all the things you mentioned, right from choosing the right domain name, to the hosting services etc. We changed ours too because of the resources being used, but are happy with the SiteGround presently. I guess you learn things over time, so for bloggers, it is all a learning curve, but if they can gain knowledge from wonderful posts like this, why not do so. I am off to share this all over, in a while, once I put up my post too – took a break to hop in here first, as I was lost in reading your post!